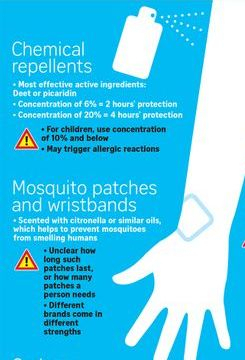 Use a repellent that contains 20% or more DEET for protection that lasts up to several hours. 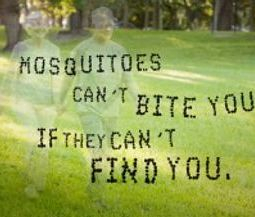 Products containing DEET include Off!, Cutter, Sawyer, and Ultrathon. Find and remove ticks from your body. Bathe or shower as possible after coming indoors. Use a hand-held or full-length mirror to view all parts of your body. A 73-year-old Belgian woman, who had a medical history of lymphoma, traveled to Kavala city (Macedonia, Greece). On August 14, 2012, she sought treatment at the Kavala General Hospital with a 6-day history of fever, headache, malaise, nausea, confusion, decline of consciousness, and neck stiffness. 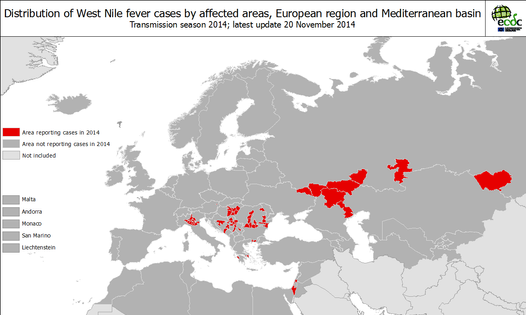 This WNV infection was acquired in Greece speciffically the Kavala region, which was highly affected by WNV in 2012. The lineage responsible for the WNV encephalitis was identified as lineage 2, the currently circulating strain in Greece. The report highlights the need for physicians and laboratory staff of all foreign countries to be aware of imported WNV infections originating from southeastern Europe, especially Greece and its neighboring countries, where recent and recurrent outbreaks have occurred (3,4). 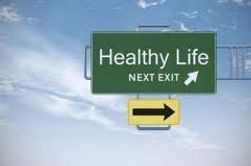 Special attention should be given to immunosuppressed and elderly patients who are at higher risk of acquiring neuroinvasive disease. 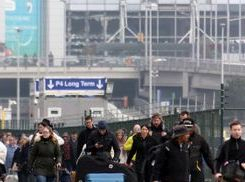 The 73-year-old patient described here was unconscious when she arrived in Belgium. After a short period of relative improvement (more reactive and cooperative), her condition deteriorated, and she died on November 23, 2012. "Even diseases that were thought to have been wiped out in Europe, such as malaria, are making a comeback. In 2011, Greece recorded its first locally transmitted malaria infection since the 1950s. Willem de Jonge from Doctors without Borders in Greece , in an interview with Deutsche Welle puts the blame on politicians. The fact that there were a lot of these mosquitoes is due to the fact that the budget from the government to spray the fields and to control the mosquito population had been cut - effectively, completely stopped in 2011. 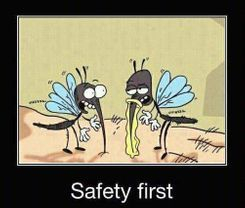 So that allowed the mosquito population to grow to new sizes," the doctor explained . 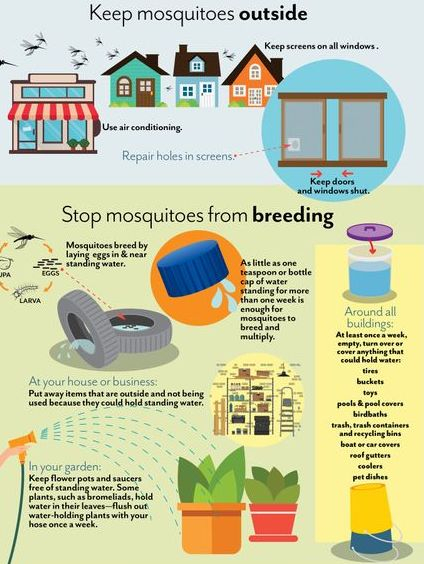 .Most people (70-80%) who become infected with West Nile virus do not develop any symptoms. Febrile illness in some people. About 1 in 5 people who are infected will develop a fever with other symptoms such as headache, body aches, joint pains, vomiting, diarrhea, or rash. Most people with this type of West Nile virus disease recover completely, but fatigue and weakness can last for weeks or months. Severe symptoms in a few people. Less than 1% of people who are infected will develop a serious neurological illness such as encephalitis or meningitis (inflammation of the brain or surrounding tissues). 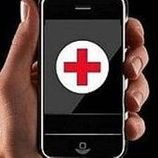 headache, high fever, neck stiffness, disorientation, coma, tremors, seizures, or paralysis. No vaccine or specific antiviral treatments for West Nile virus infection are available. In severe cases, patients often need to be hospitalized to receive supportive treatment, such as intravenous fluids, pain medication, and nursing care. Forty-three West Nile virus cases were reported in EU during the past two weeks, which indicates a clear increase compared to a total of 54 cases during the whole 2016 transmission season. Although there’s a noted peak in the reported West Nile fever transmission in EU recently, the overall number of cases is still within the expected ranges for the disease transmission season. Thirty-two new cases were reported in the EU Member States in the past week, and 11 cases – in the week before. For the first time Cyprus has reported a West Nile fever case, but investigations are still ongoing to estimate the risk of local transmission. During the week before, 11 new cases have been reported in EU, by Hungary, Romania and Spain. In the neighbouring countries (Israel, Russia and Serbia), 19 and 21 new cases have been reported in the past week and the week before, respectively. 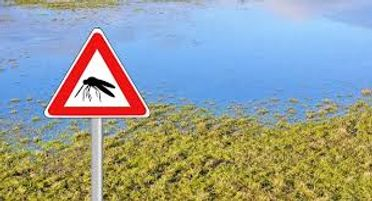 In 2011, most WNV cases were confined to the Eastern Attica prefecture, particularly in the Marathon municipality, where wetlands provided a favorable environment for the reproduction of mosquito vectors. However, during the summer months of 2012 and 2013, cases spread to municipalities of southern and northern Attica. Sporadic cases also were reported from southwestern Greece, including Achaia, Ilia and the Ionian Islands. IgG antibodies were detected in patients from previously unaffected regions, suggesting the previous circulation of WNV in these areas, the researchers noted. 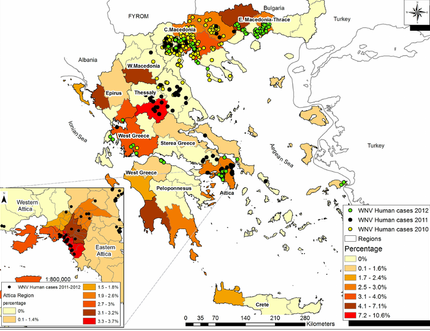 Although the use of larvacides in mosquito-breeding sites in 2014 had successfully reduced the number of emerging vectors and led to a significant reduction of cases, the spread of WNV in newly affected areas indicates that the disease has been established in Greece and cases may continue to occur in the future, according to the researchers. Mavrouli M, et al. Abstract P0635. 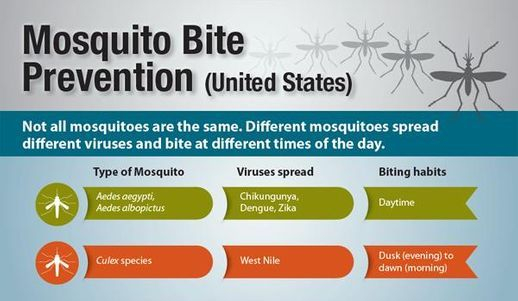 The Greek CDC reminds to people of all ages that the West Nile virus is carried by birds and is transmitted to humans and animals through the bite of the common mosquitoes, that fly around in Greece during the summer season. • the spatial definition of areas of disease outbreak with local transmission in order to inform travelers from abroad"
Accommodation on the Greek islands includes often “rooms-to-let” , traditional local houses that keep running the authentic travel- hospitality family tourism business, and that is possible not to be adequately informed or equipped. 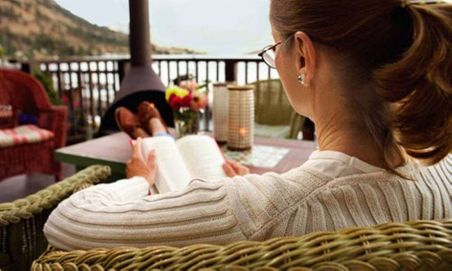 *** Ask your travel agent before you travel on that, or the hospitality desk in your hotel, or the owner of the room-to-let business wherever you are found. If not possible to be provided to you , try to find cheap, portable sieves for the windows. Use anti-repellent in room and on you, on your beloved ones, and y our pets. Everyone to avoid Any Bite . 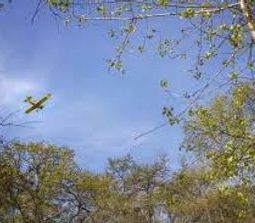 using insect repellent substances in exposed skin and on top of the clothes, especially during outdoor activities in the afternoon or evening. 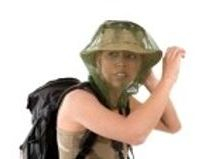 Since the mosquito swarms are extensively infected , though, on the areas of mainland and island Greece, skin and clothing protection is wiser to be kept constantly 24/7. little pots (even in the pet’s water cup) , all these should not at all be left openly, especially on mosquito breeding hours from sunset to sunrise. The public health authorities , being set in emergency mobility for any West Nile virus infections this year, expressed their enormous concern today , Tuesday July16, for the protection of the Greek population and of the foreign visitors from any possible West Nile epidemic, while the Greek CDC announced the first confirmed case of WN in the region of Attica. Coordinates of a multisector Working Group (WG) on the definition of affected areas by vector borne diseases. 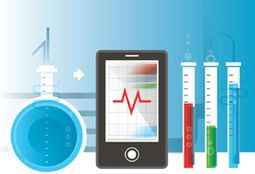 This WG considers all available entomological and epidemiological data and decides on the characterization of affected areas, for the implementation of blood safety measures. 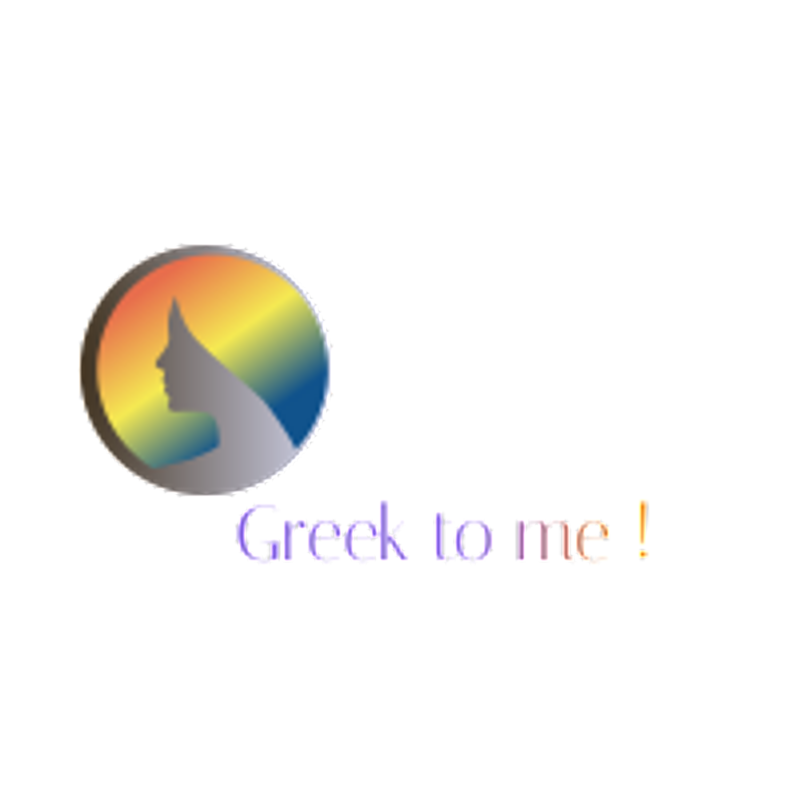 The list is published on the Greek CDC webside (www.keelpno.gr) and updated regularly. Mutated hybrid populations of mosquitoes have been identified in Greece in 201O when the WNV started. 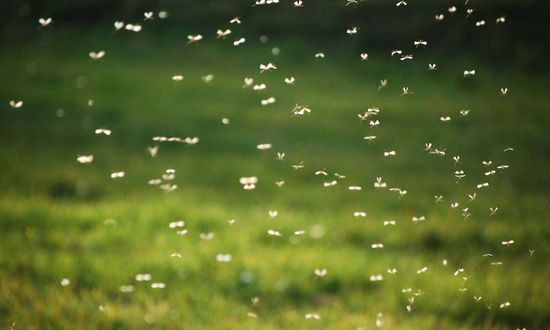 While the common mosquitoes in Attica and elsewhere in Greece are infected, health officials are seriously concerned of the possibility of a new mutation of the WNV that will allow the transmission of the virus from birds directly to humans. Read the top story by the Greek Researcher's statements who recently announced the findings about the hybrids . 1.1 Enhanced surveillance for encephalitis and WNV disease in humans. i. Enhancing awareness of physicians about the surveillance of encephalitis and suspected cases: testing for West Nile virus infection in suspected cases (such as cases with encephalitis, aseptic meningitis, acute flaccid paralysis, fever of undetermined etiology) was recommended. .
ii.Daily communication and information exchange with laboratories conducting diagnostic testing for West Nile virus. iii. The Department of Epidemiological Surveillance and Intervention of HCDCP -within 24 hours- undertakes the investigation of every reported case of West Nile virus disease in order to determine the likely place of exposure, the risk factors and the severity of the disease. 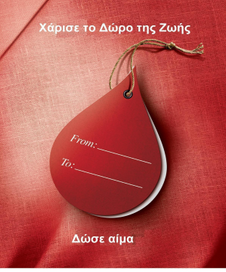 Development and Food, Regions, Directorate of Public Health and Social Welfare, National Centre for Blood Donations, National Transplant Organization, laboratories). 1.2 Entomological surveillance: In 2013, the HCDCP in collaboration with the Department of Parasitology, Entomology and Tropical Diseases of the National School of Public Health is implementing a targeted entomological surveillance program, in the Attica region. According to our findings, we recorded the circulation of West Nile virus in the area since the end of May 2013. 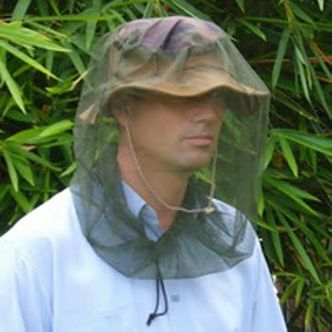 Organized expansion of entomological surveillance nationwide has been planned in cooperation with local authorities and the subcontractors of the local mosquito control programs. 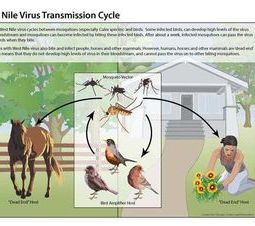 1.3 Collaboration and exchange of information with the Veterinary Public Health (VPH) services of the Ministry of Agriculture, especially regarding WNV infection in equidae. 2.1. Awareness raising among health professionals by providing guidelines for the recognition and diagnosis of WNV disease and the recommended laboratory investigation of suspected cases (e.g. encephalitis cases). various areas around the country. 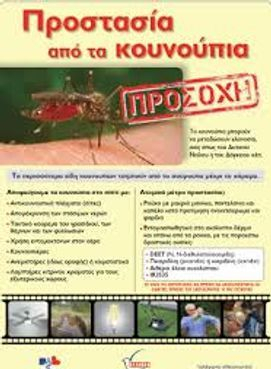 The Hellenic CDC website includes educational material for the public regarding the disease and the recommended protective measures against mosquito bites. WEST NILE FEVER DATA, 2014 The figures for the 2014 season are as follows: 74 autochthonous cases were detected in the EU and 136 cases in neighbouring countries. In the EU, cases were reported from the following countries: Austria (1), Greece (15), Hungary (11), Italy (24) and Romania (23). 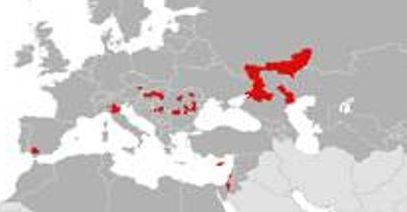 In neighbouring countries, cases were reported in Bosnia and Herzegovina, Israel, Palestine*, the Russian Federation and Serbia. This year the epidemic was significally diminished to less than thwe one third of the number of cases that have occured in Greece, since the start of the WNV epidemic in 2010 Still , the disease of West Nile Virus Infection remains fatal, and there are quite enough Greeks, and people all over the world that have paid with their valuable life a single insect bite . (febrile syndrome) One more death in a patient with WNND was attributed to other causes. West Nile virus cases surfaced in 2010 and has affected more 500 people . Greece confirmed 262 West Nile cases in 2010, 100 in 2011, and 161 in 2012. Of those 523 cases, 381 (73%) involved neuroinvasive disease. "Based on the observed dynamic in the last 3 years, further human cases can be expected in the coming years", according to the Greek CDC assessement and the ECDC estimation. The West Nile virus infection epidemic in Greece, is now in its fourth year. During the outbreaks in 2010, 2011 and 2012, the same virus was identified. • The 2012 outbreak (20 June to 7 October, peaking in the second week of August) involved 161 patients. Cases were mainly reported in Attiki, East and Central Macedonia, and Thrace (Xanthi, Kavala, Drama).